In last tutorial we have seen how to create basic POM framework, but in organization level framework should serve all the needs. Page object model contains several packages, let's learn about each package and its purpose in the framework. constants : conatsnts package will have all the constant file like Css properties, Attribute properties. data : data package will have all the data handling java files like handling excel, handling properties java files..
test : test package will have all the testcases in framework. Logging is very important for framework, without logs user may not be able to find the execution point. 2. Create a static block, as we are not going to change anything in the log4j properties during run time, we can hard code the values. Static Block : static block will be executed once the class is loadded to stack, static block executes even before main method. 3. Create variable called log for logging the all the logs from the framework, which shloud be static and public, so that we can access across testcases. It is important for any framework to work with data changes without re-compilation, Apache POI helps us to read data from the excel sheet in selenium webdriver. 2. To support multi-threading we have to write all the method as non-static methods. 3. Let's write method called readExcel which accepts the Excel file name, Excel Sheet name, row number, column number. 5. We can log the data that we retrieved from the excel. 3. Log the data that we about to write to the excel. When we donot have much data or when we have data which almost never going to change, we can use data in Properties file such kind of situations. Details like username, password, application url. 2. Create non-static metghod called readProperty, which should accept following parameters Properties file name, Property name. readProperty method should return a string value. 1. Write non-static method called writeProperty, which should accept following paramaters Properties file name, Property name, property value. 2. Create Properties class object to access the property file. We have to initialize our browser and we have to store it in driver variable. We should initialize the browser at top most class in page object model, so that we can use the driver across all other scripts. This class should not have any scripts. 2. Initialize 'browser' variable with object of the EventFiringWebDriver to listen to all the events occurring in framework. This browser only will be used across all the testcases for accessing all the elements from the webpage. 4. We have to write if else condition block to decide which browser to open based on the value retrieved from the properties file. We will be using some constants in our application framework, instead of writing those contants on test or lib files, we can write all of them under contants package. 1. 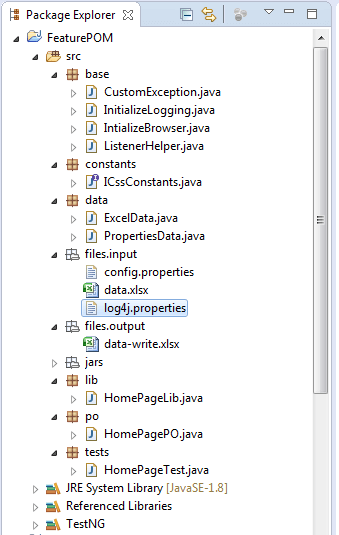 Create a java Interface called ICssContants under constants package. 2. Write all the properties as public static String variable. 4. By this way we can avoid creation of string during run time, and also can avoid duplicate strings. 5. Write all the methods as non-static methods, and return the values if required. We have create testcase class to create test scripts, which are nothing but automation scripts for ourmanual testcases. We are using TestNG tool for mapping manual and automation testcases. 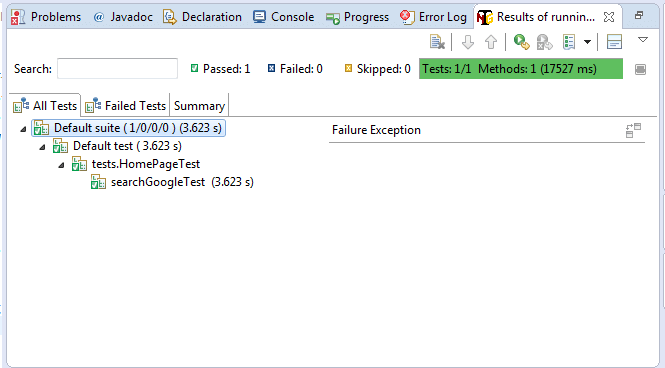 Every @Test denotes that it s a testcase, and result will be generated based on this test. 2. Import the static member of the InitializeBrowser class so that we can acces browser variable. 1. 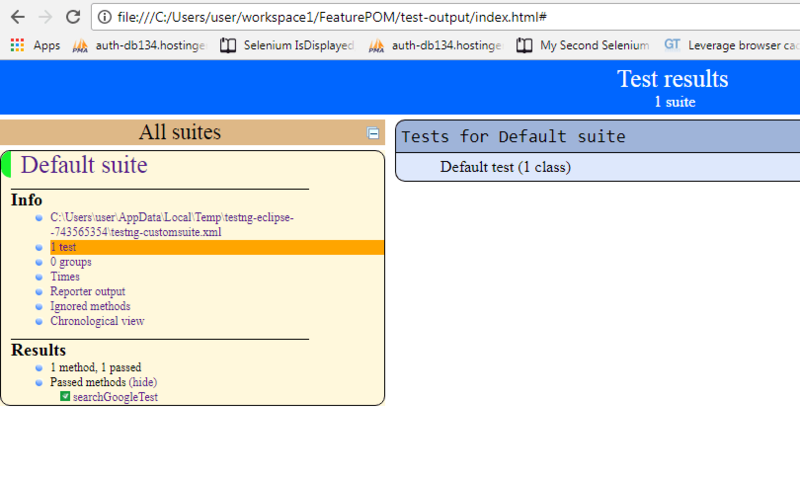 On the eclipse console we can check the result under TestNG section.